Why Is Potassium Important For Dogs? Potassium is a mineral that is crucial for a proper body functioning. This is true for both dogs and humans, but what can you do in order to ensure your dog’s potassium levels are in optimal balance? How do you know if your dog has his potassium levels out of balance? Read this article and learn everything you need to know about this topic. What could be behind your dog’s recent panting and shaking? Does it indicate a health problem? This article will let you in on some answers. Golden retrievers are among dog breeds that are more susceptible to develop allergies. In this article, we’re exploring the most common causes of allergies in Goldies, as well as the best ways to treat them. Just like in humans, allergies can develop in dogs too. However, some dog breeds are more prone to having certain types of allergies when compared to other breeds. Today, we’re exploring the most common causes of allergies in French Bulldogs and the best ways to treat them. Every breed is prone to certain health problems. Pugs have a predisposition for eye problems. Read this article and find out more. Protecting your dog from extreme weather conditions is crucial in order to maintain your pup’s health optimal. But how to know when the weather is too cold for your dog? What does their tolerance to cold depend upon? Read on and discover all the answers related to dogs and cold weather. Think your dog has Kennel Cough? Read on to find out the symptoms that indicate it, as well as the best remedies that help heal Kennel Cough faster. The best way to avoid most of unpleasant situations is prevention. Better be safe than sorry! This is especially true for holidays as we do not want anything ruining our special moments shared with our loved ones. These most common mistakes people make while decorating their homes can be very dangerous for our pets. Read on and discover 10 essential tips you should implement this year to make your household safe during winter holidays! 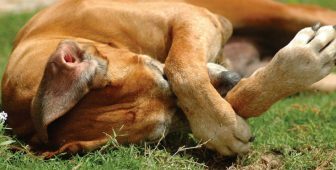 Dogs tend to hide pain and discomfort quite easily for longer periods of time. But when they can’t ignore it anymore and become these sad, vulnerable creatures, our hearts break at the mere sight of their suffering. The next we do is search for best pain reliefs for our pup. Discover everything there is to know in this article, as well as which medications are safe, what not to give to your dog and the natural ways of managing pain. Every dog experiences a diarrhea at some point in their life. Learn about the easy ways to treat it at home. But while the condition of watery stool is not always alarming, dog owners should know when it is time to consult a vet.